Species about 12, mostly in warm and tropical regions. 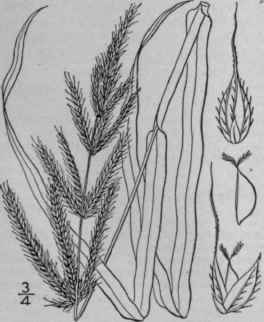 Type species: Panicum Crus-galli L.
Spikelets 1l/2" long, the second and third scales more or less awned. Spikelets 1" long, the second and third scales merely awn-pointed. Sheaths, at least the lower ones, densely papillose-hirsute. Panicum Crus-galli L. Sp. PI. 56. 1753. Echinochloa Crus-galli Beauv. Agrost. 161. 1812. Culms 2°-4° tall, often branching at base. 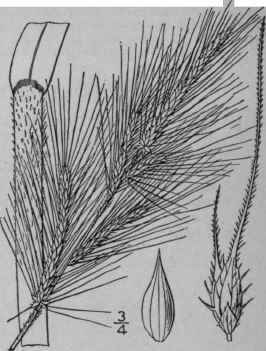 Sheaths smooth and glabrous; blades 6'-2° long, 1/4'-1' wide, glabrous, smooth or scabrous; panicle composed of 5-15 sessile erect or ascending branches, or the lower branches spreading or reflexed; spikelets ovate, green or purple, densely crowded in 2-4 rows on one side of the rachis; second and third scales about 1 1/2" long, scabrous or hispid, the third scale more or less awned, empty, the fourth ovate, abruptly pointed. In cultivated and waste places, throughout North America except the extreme north. Widely distributed as a weed in all cultivated regions. Naturalized from Europe. Aug.-Oct. Loose panic-grass. Panicum colonum L. Syst. Ed. 10, 870. 1759. Panicum Walteri Ell. Bot. S. C. & Ga. 1: 115. 1817. Not Pursh, 1814. Echinochloa colona Link, Hort. Berol. 2: 209. 1833. Culms tufted, smooth and glabrous, 6'-2 1/2° tall, often decumbent and rooting at the lower nodes. Sheaths compressed, usually crowded; blades flat, 1'-7' long, 1"-4" wide; inflorescence composed of 3-18 1-sided more or less spreading dense racemes, 1/4'-1 1/4' long, disposed along a 3-angled rachis and generally somewhat exceeding the length of the inter-nodes; spikelets single, in pairs, or in 3's in 2 rows on one side of the hispidulous triangular rachis, obovate, pointed, the first scale about one-half as long as the spikelet, 3-nerved, the second and third scales a little more than 1" long, awn-less, 5-nerved, hispid on the nerves, the fourth scale cuspidate. Fields and roadsides, Virginia to Kansas, south to Florida and Texas. Common in all tropical countries. March-Sept.
Panicum hirtellum Walt. Fl. Car. 72. 1788. Not All. 424. 1843. Echinochloa Walteri-Nash, in Britton, Man. 78. 1901. Culms 3°-6° tall, robust, smooth. 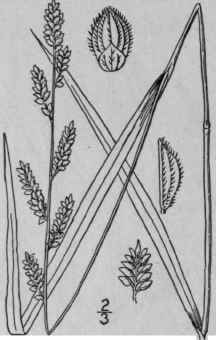 Sheaths, at least the lower ones, papillose-hispid; blades 1° or more long, 1/2'-1' wide, generally smooth beneath, strongly scabrous above; panicle 6'-18'long, consisting of 10-40 ascending or spreading branches; spikelets ovate-lanceolate, densely crowded in 2-4 rows on one side of the scabrous and hispid rachis, brownish purple; second and third scales about 1 1/2" long, scabrous and hispid, tipped with upwardly barbed awns, sometimes 10-20 times their length; fourth scale ovate-lanceolate, acuminate. In marshes and ditches along the coast, Ontario to Rhode Island, Florida and Texas. Aug.-Oct.